This is the first AAR for COMMAND: Modern Naval/Air Operations: Northern Inferno. 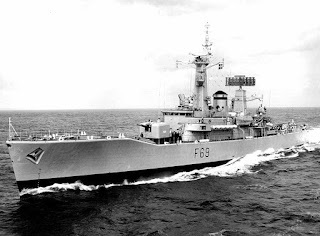 While shadowing a Soviet Echo II in the Gibraltar Straits, the Frigate HMS Ashanti was sunk with heavy loss of life. In London, the Prime Minister laid the blame for the incident squarely on the Soviet shoulders and has asked the Soviet Premier for an apology and appropriate reparations. Meanwhile, the Soviet Politburo has accused the Royal Navy of dangerous violations of international maritime law, and has labelled the incident as "tragic but unavoidable". Both sides have placed their naval forces on full alert. 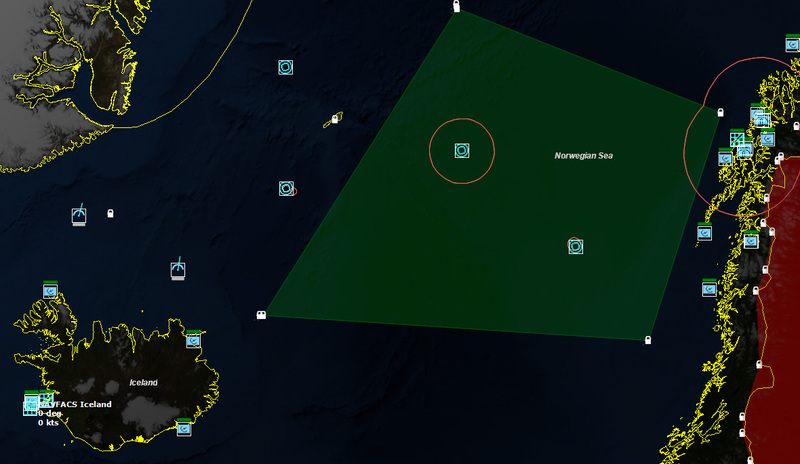 In the Norwegian Sea, STANAVFORLANT (Standing Naval Force Atlantic) has sailed from Faslane and taken a war footing in vicinity of Jan Mayen Island, and assumed an ASW posture. Shortly after receiving news of the Gibraltar incident, all NATO Forces have assumed the Second Degree of Readiness and are now preparing for war! Soviet fighter, attack, and bomber reinforcements have arrived in large quantities on the Kola Peninsula, boosting the already formidable force normally based there. The most fearsome new addition is two Backfire regiments of the Soviet Strategic Air Armies, operating a total of sixty bombers. 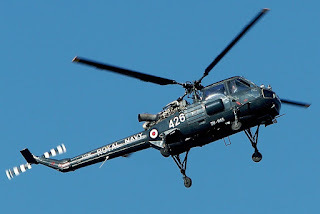 The Backfires will be tasked with supporting the Northern Fleet's push into the Norwegian Sea, adding awesome striking power to the Northern Fleet Naval Aviation's existing three Badger regiments. 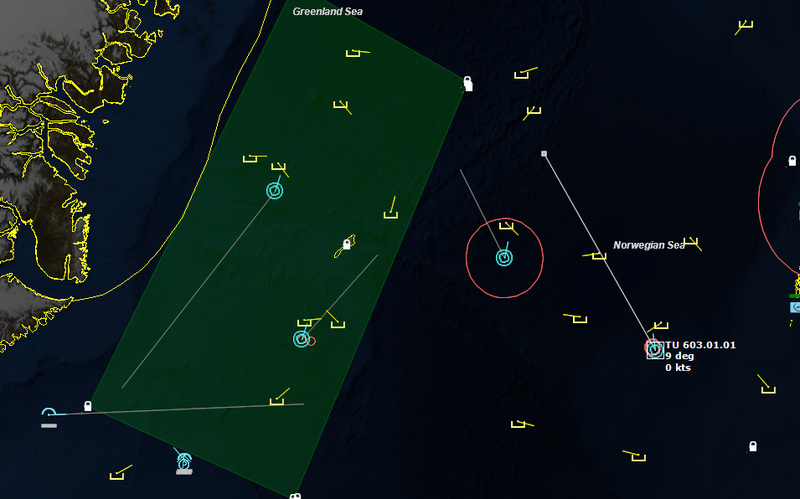 In the Norwegian Sea, NATO's STANAVFORLANT (Standing Naval Force Atlantic) has sailed from Faslane and taken a war footing in vicinity of Jan Mayen Island, and assumed an ASW posture. Shortly after receiving news of the Gibraltar incident, all NATO forces have assumed the Second Degree of Readiness and are now preparing for war. Is war really unavoidable? Gameplay Tip: NATO's underwater surveillance network (SOSUS) will rapidly flood you with a large number of underwater contacts, cluttering your map. Don't panic! Not all of them are enemy submarines. Give the SOSUS operators a little time to start identifying neutrals, biological etc. The colour of these contacts will turn green. You can use this time to start arranging your air patrols, give orders to your forces etc. Once you begin having positive classifications of "greens", filter them out right click on each desired contact and select "Filter out". 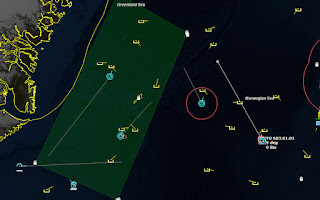 This will remove almost all visual information about the contact from the map except for its icon and thus allow you to focus on investigating and prosecuting the possible enemy submarines. Situation CINCLANT has directed the multinational task force STANAVFORLANT to move into the Norwegian Sea at high speed, in response to the Soviet Forces deploying in the area. Enemy Forces P-3 Orions on ASW sorties in the Norwegian Sea indicate that Whiskey-, Zulu- and November-class submarines are located in the vicinity of Jan Mayen Island. It is reported that these submarines are deploying to set up a patrol line to the South of Jan Mayen to intercept any NATO shipping. 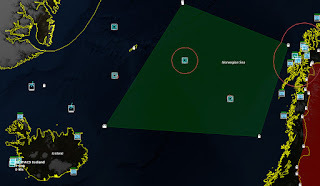 STANAVFORLANT has been ordered to prevent the Soviet submarines from entering the North Atlantic area via the Greenland, Iceland United Kingdom Gap (GIUK Gap). 1. STANAVFORLANT is to patrol the designated ASW-patrol areas and prosecute all Soviet submarines. Areas allocated are "ASW Patrol Area 1" and "ASW Patrol Area 2". COMSTANAVFORLANT is to divide his forces as required to patrol areas. 2. Land based air assets to assist STANAVFORLANT in assigned patrol areas. August 7, 1975, 213000Z The first thing to do is set up patrols. Patrol Area 1 is a rectangular area in the Greenland Sea that encompasses Jan Mayen. P-3 Orions and a Nimrod out of Keflavik would patrol it from the air, while TU 603.01.03 and 04 would patrol it by sea. Patrol Area 2 was an irregular area to the east of that to the Norwegian coast. P-3s out of Andoya would patrol that, as would TU 603.01.01 and 02. 213030Z As expected, the SOSUS arrays pick up a lot of contacts. It will take some time to classify them into threats. 213700Z Two of the many contacts have been type classified as SSNs. 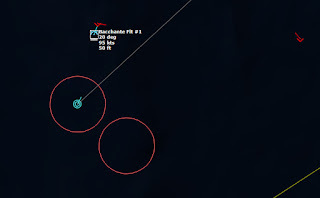 One is close to TU 603.01.04, which moves to intercept, while the other is in open water in Patrol Area 2. A P-3 is tasked to investigate. 1. ALL UNITS ASSUME A WAR FOOTING. 2. ONE HOUR AGO A NATO P-3C WAS SHOT DOWN IN THE VICINITY OF BANAK BY SOVIET MIG-23 FLOGGER. 3. ANY SOVIET AIR / SURFACE / SUB-SURFACE UNIT IS NOW CONSIDERED HOSTILE. 4. 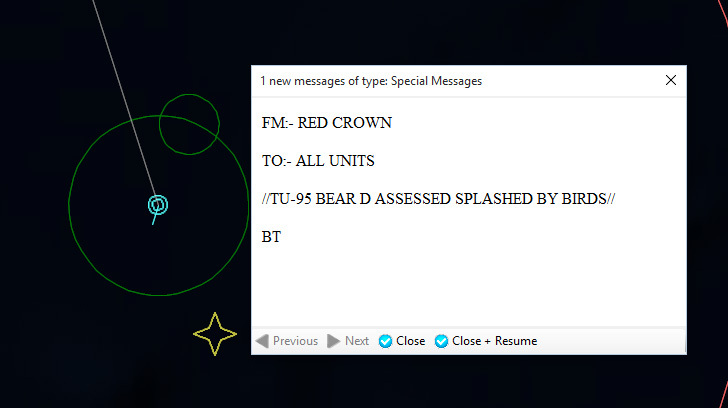 THE USE OF NUCLEAR DEPTH CHARGES, SURFACE TO AIR MISSILES IS AUTHORISED. 214831Z Several contacts are type classified as Biologics, which helps the situation a bit, and narrows down the number of targets to prosecute. Dragon 11, a P-3B Orion, launches a torpedo against Goblin 25, which is an unknown contact. 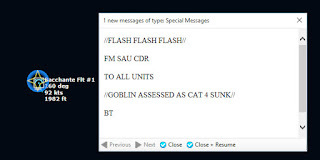 It turns out that Goblin 25 is a Biologic… Nice going guys. Getting a little jumpy? 215404Z SSN 15 is classified as a PLA-671RT Victor II [Syomga]. First confirmed hostile target. 215416Z SSN 18, near TU 603.01.04 is classified as a PLA-627A November [Kit]. 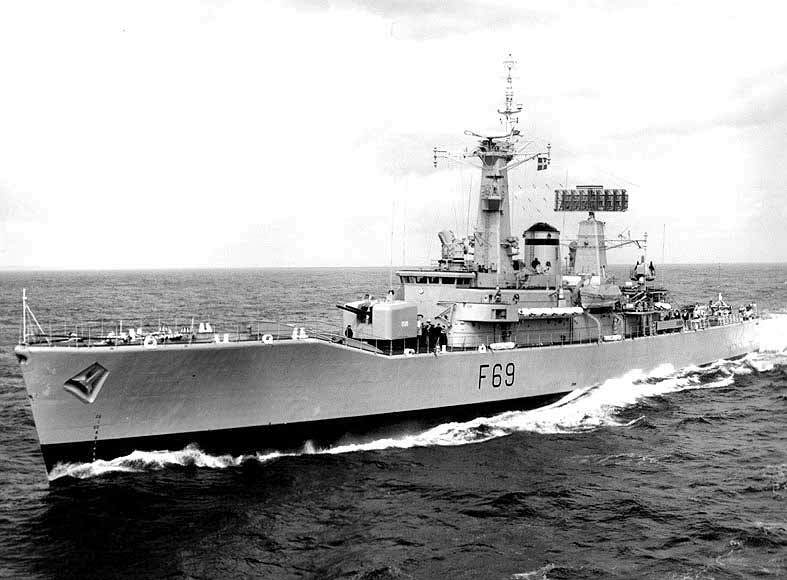 HMS Bacchante launches a Wasp (Bacchante Flt 1) to attack the contact with depth charges. 220021Z SOSUS classifies multiple contacts, two Zulu IVs, two Foxtrots, one Juliett, one Whiskey V, and one Charlie I [Skat]. 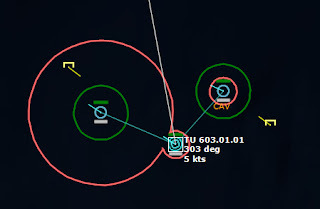 TU 603.01.01 and TU 603.01.03 both launch helos to intercept the closest targets. TU 603.01.02, without any aircraft, continues to close in its target, a Zulu IV. 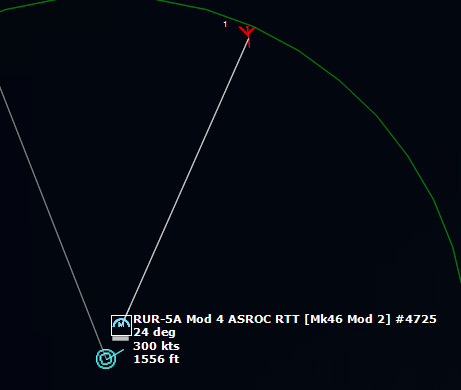 220300Z Bacchante Flt 1 approaches its target, November 18. 220421Z Bacchante Flt 1 sinks its target with a depth charge. 220800Z Algonquin Flt 1 approaches its target, Foxtrot 8. 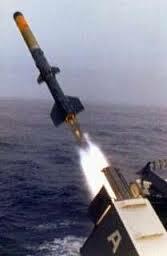 Algonquin Flt 1 launches a Mk 46 LWT Mod 1 torpedo, which hits the Fotxtrot. The Foxtrot is damaged, but not sunk, so the Algonquin Flt 1 launches another torpedo to make sure. The second torpedo hits, and finishes it off. 221126Z Fraser Flt 1 approaches its target, a Whiskey V. Two torpedoes later, and the Whiskey V is sunk. 221401Z Most of the detected Soviet submarines do not have missiles, and so can safely be attacked by surface assets, but two, the Charlie and the Juliett, are missile capable, and therefore it would be prudent to tackle them with airborne assets. Unfortunately, the Charlie is very close to TU 603.01.04. Bacchante Flt 1 still has a Mk11 Depth Charge, however, and is moving to engage the Charlie. 222225Z Bacchante Flt 1 sinks the Charlie with its depth charge. One of the major threats has been eliminated. 223155Z USS MacDonough gets into range of a Zulu IV contact, and launches a RUR-5a Mod 4 ASROC RTT [Mk46 Mod 2] at the contact, near maximum range. The torpedo damages the submarine, but does not destroy it, so the MacDonough fires a second ASROC. The Charlie responds by diving deep and fleeing, and the second ASROC misses. 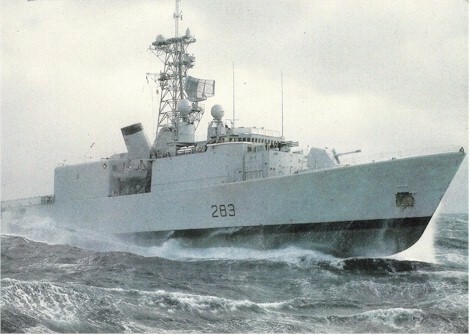 The MacDonough, which had previously changed course to evade any retaliation, now turns back to continue prosecuting the target. 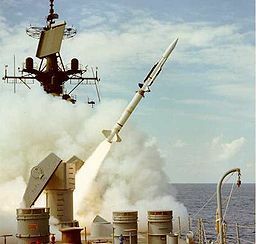 223847Z The third ASROC Mk 46 hits the target, sinking it. 223951Z HMCS Algonquin and FGS Lubeck detect a pair of bogeys bracketing the group to the east and west. The bogeys appear to close in. So far the contacts are detected by passive sensors only. The Algonquin waits in ambush for the bogey to get in range before turning sensors on. 224346Z The Bogeys are getting too close for comfort, and are approaching the groups. Time to declare them hostile. 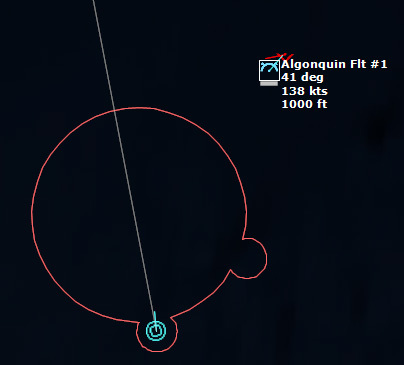 The bad news is, both bogeys are flying at 36,000 ft, which is above the range of the Algonquin’s Sea Sparrows. Bogey 28 flies by the Lubeck and continues on, while Bogey 27 flies over the USS Mispillion, then the Lubeck, and continues to circle the group. 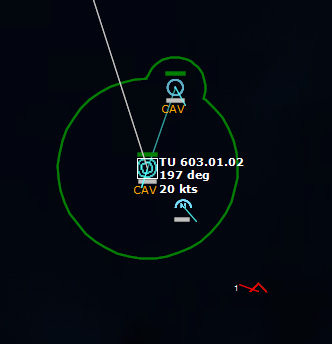 230600Z Assuming that the bogey that had earlier buzzed the Lubeck was still enroute, USS MacDonough waits in ambush, and then switches its radars on. Contact! The target is declared hostile. 230620Z MacDonough launches a RIM-67A SM-1ER at the bogey. The first missile misses, but the second brings down the target, identified as a Bear-D.
A pair of P-3B Orions close in on the Juliett and begin dropping sonobuoys. 232111Z The Juliett is localized and the attack begins. Torpedo away! 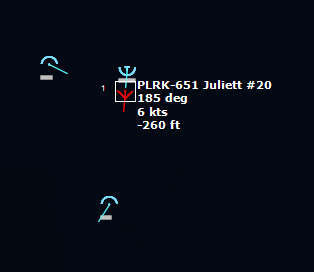 The first torpedo damages the Juliett, but the second, third, and fourth miss. Finally, the sixth torpedo sinks the Juliett. 233622Z In the meantime, another P-3B Orion attacks a Zulu IV, damaging it with a Mk46. A follow-up attack finishes it off.